A short mediation on how human uniqueness might have come about, by a world class student of human fossil evolution. Different researchers have quite different takes on what really makes us different from other primates, on what is quintessentially and uniquely human. Here we get Ian Tattersalls view. The creative spark sets us apart, he argues. Language and creativity, and the mental states behind them, appeared suddenly and not gradually — humans literally sprang into existence. Prehaps the sudden appearance of these creative behaviors reflected the evolution for the first time of the neural pathways in the brain responsible for the syntax of language, that most particularly human of activities. Whatever your own personal views on this subject, you will not be able to resist being interested in Tattersalls. 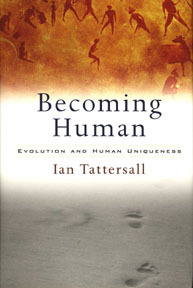 Hes a good writer, knows a lot about human evolution, and his opinion is well worth listening to.